Congratulations Tarbox School! You are the 2019 Imagine Literacy Bowl Champions! You beat out over 13,500 schools across the country to win the first ever Literacy Bowl. Awesome work! The Lions Club Cares and Shares! The Lions Club truly embraces its mission to serve their community and those in need! All 297 students at the John K. Tarbox school received a warm blanket as part of the Lions Club generous donation. The Lions Club also donated over 50 winter coats and $50.00 Market Basket gift cards. Thanks to our fabulous guidance counselor, Ms. Eva Castro for reaching out to the Lions on behalf of our students! We called, and they answered! While many of us look at a coat as an item that is meant to keep us warm and stylish, there are many less fortunate struggling to provide that basic neccessity. The Tarbox school would like thank grade 4 educator Stacey Mann and the Knights of Columbus organization for their very kind donation of 8 winter coats. The John K. Tarbox school celebrated its fourth annual Thanksgiving Feast. Thanks to our wonderful families, the event was once again a huge success. We had enough food to eat plentiful and also to donate to Lazarus House. The Tarbox school principal, Dr. Ada Ramos, recognizes the fabulous grade 5 science teacher, Nina Piro, for obtaining the highest CPI score in the district. Her score was also higher than that of the state's. Congrats! 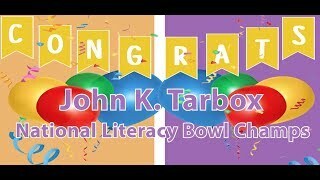 Congratulations to the Tarbox School, the Imagine Learning National Literacy Bowl Champions!